If you are called into a meeting by any company manager or corporate security, please tell them... If this discussion could in any way lead to my being disciplined or terminated, or affect my personal working conditions, I respectfully request that my Union Representative, Officer, or Steward be present at the meeting. Without representation, I choose not to answer any questions. See Member Resources menu for a copy of a grievance form. 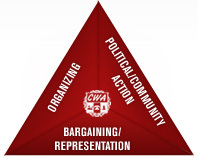 Union membership meetings are every 2nd Thursday of the month at 5:30pm. The location is: CWA Local 6450,600 SW Jefferson, Suite 201 Lee's Summit, MO 64063, Phone: 816-246-6450.